Best Priced QX60 in Midwest. Brand New Tires. Perfect condition inside and out! 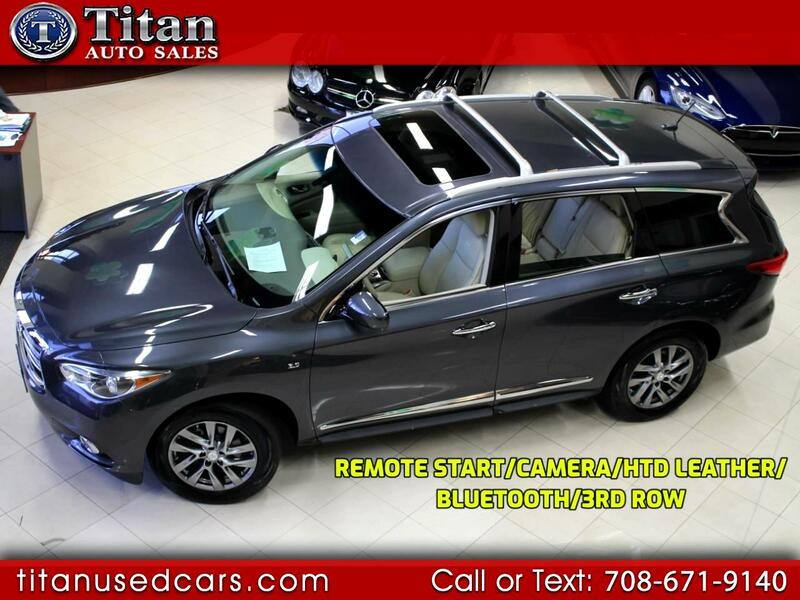 Features Bluetooth, Back-up Camera, automatic HID headlights, BOSE 13-Speaker Cabin surround sound system, Dual occupant memory Seats, Infiniti intelligent all-wheel drive, Remote Engine Start, power sliding moonroof, tri-zone automatic climate control, Auxiliary Audio Input, Heated Seats & Steering Wheel, 8-way power drivers seat, 18-inch Forged Aluminum wheels, Sirius X/M Satellite radio, Electronic stability control, Rear parking aid, power liftgate, power tilt/telescopic steering wheel, push button ignition, side curtain and side impact airbags w/rollover sensor, anti-lock brakes, brake assist w/electroni brake force distribution and a 3.5L 265 horsepower engine. This QX60 is prices at less than half of original MSRP of $46,045! Buy with confidence from our AAA++ rated business. Come in and see why our quality, reputation and prices can't be beat! Check out our hundreds of positive google reviews. Message: Thought you might be interested in this 2014 Infiniti QX60.